At the end of the 19th century, Britain experienced a huge puzzle craze. I managed to pick up a number of puzzles famous during that period in flea markets, despite their rarity. Based on these original puzzles from Britains's famous puzzle period, this is one that we have successfully revived in its new form. The key word here is "antlers". Can you free the antlers... and then put them back together again? 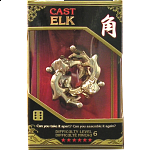 People who purchased Cast Elk also purchased the following puzzles. To my eye, this is the prettiest of the Cast series. It's also a remake of a classic British puzzle, which I think is a nice idea. The original puzzle has identical pieces, so it's easier to solve. 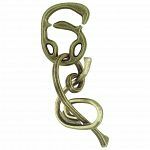 Hanayama updated it by making the pieces slightly different so only one of the mirror image solutions works. That doesn't make it that much more difficult though. I only gave it four stars because of the inaccurate difficulty rating. For comparison, Vortex is a Level 9 (Hanayama 6) and has a much longer solution with more intricate movements and many possible dead ends. Elk is very pretty and has a nice subtle solution, but is overrated by one or two difficulty levels. 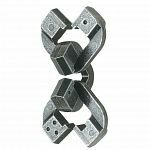 Since Puzzlemaster has already developed solutions for the whole Hanayama series, I'd suggest that someone there could re-assess the ratings instead of just converting the Hanayama ratings one-for-one. This puzzle is pure masterpiece. Solved it within an hour, didn't understand, why. Then tried to solve it again with no luck, spend almost a day until noticed one very important thing. It looks so simple, but it's really deep and clever puzzle with a "twist" :) Must have! An indeed very good puzzle and for me very difficult to solve i did it by luck the first time and then i saw the routine and got it finally. The amazing is that after a while i forgot how it was solved and it was like have bought it for the first time. Highly recommended. My first Hanayama, very, very happy. I've had it a long time and absolutely could not get it apart, I ended up looking at the solution and heating, and then got is apart and back together. I then spent some time figuring out why it works, which I now fully understand and can solve intuitively, without memorising a set path. Those who think the two pieces are not the same don't understand, one has N.O.B, and one 'Hanayama', but apart from that they are the same, it doesn't really make a difference if they were labelled differently. In fact, it would have been better I think if they didn't label them differently and also put the deers face on both sides of each piece, forcing you to recognise the small feature that allows you to solve it to know which way each piece was facing. Plan on buying more, get it! One of the cast puzzles I solved relatively quickly. As others have said before me, the fact that there are few possible moves could lead you easily to the indeed impossible-to-spot solution. The two elks are not perfectly similar, as well as the antlers of each. 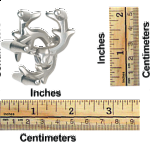 There are differences only in parts of the millimeter, which lead to only one possible solution, and not two symmetrical. But I like the design itself very much. Such elaborate and beautiful in the same time. Clever, aesthetic. One of the best Hanayamas. I bought this knowing it looked great and them solved it within an hour. Then found myself studying it and why there was only one way to solve. After that I brought it to work and had a blast seeing others struggle with it four hours only to end up back at the starting point. Worth it for me. awesome puzzle, but why level 6? it sould have been level 4. 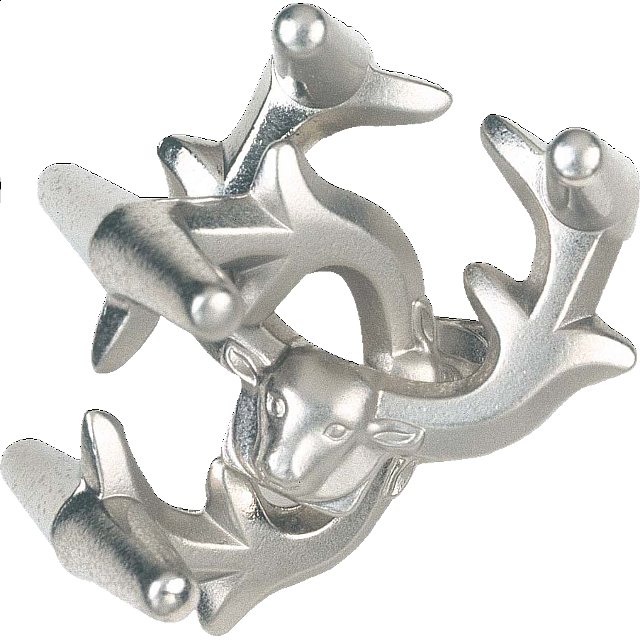 This was my first hanayama puzzle. I really like this one for that reason and I like the design too. It's not too difficult but it offers a little challenge. Awsome thing, like it very much , HIGLY RECOMMEND FOR BEGGINNERS! The elk is a level 10? Yikes - I received one of these as swag at an IT trade show and had it apart and back together again reliably within about 10 minutes. Who decides on these ratings? After spending two days on Enigma and finally managed to understand it, i bought Elk, both level 6 rated. I was disappointed to have Elk understood within half an hour. Very nice puzzle but was hoping for more of a challenge. Really good puzzle but not a 10. Nice looks and horns to restrict movement. A beautiful piece of work. This puzzle doesn't deserve the difficulty rating, there are much harder Hanayama ones available. That being said, it is one of those puzzles that if you pick it up again a few months later, it is just as challenging to do as the first time (just not THAT challenging). great looking puzzle. very challenging the first time around, but once you figure it out its not terribly hard to put back together. this is one of my favorites. deffinately worth the "10" rating though. This is the Hanayama puzzle that got me addicted. I've purchased eight more since! This puzzle just feels good in the hands. If you jostle this around long enough you will get it apart, and maybe even back together. But to really solve it and be able to quickly assemble/disassemble at will is a whole different story. Enigma was harder, but this is still my favorite due to its "elegance." Hard. Still figuring it out after only half an hour. Great difficulty and fun. Great puzzle.. great workmanship. Pretty. Possible to randomly stumble on solution which ruins fun, but can also solve it without realizing like me. After about 15 min of jingling noticed unique feature, and had pre-solve state several times, but for over an hour stubborn thinking THATs too easy and there must be some elaborate way. Good thing I looked at the clue given on the box and solved it then before going to bed or I would have been up all night..
i've had this thing for two weeks and still can't get it apart i've given it to many friends and co-workers and it hasn't been apart yet. I would download the solution but even that isn't being sent. this is the best of the six puzzles i have purchased so far. I really liked this puzzle. There are not many steps, but one is counterintuitive in a clever way. I thought Chain, News, and Nutcase, and Vortex were harder. Loved it. My husband also took it apart by accident in a few minutes, but took hours to get it back together, so be careful! A lot of fun, highly recommended! This puzzle took me twenty minutes to get apart but took a bit of time to figure out why. I think I may have gotten lucky but still don't consider this level appropriate. Over all not a bad puzzle. The funny thing about this puzzle is that the solution should apply symmetrically, but because metal is removed at strategic locations during manufacture, only one sequence is possible. In other words, mirror image solutions should work, but do not. That is probably why each piece is uniquely labeled. It was not so easy to solve it at first time, but when you get it it´s just three moves and it is open. Still I recommend this. It is really worth of buying. Very nice-looking. However, I was a bit disappointed by its difficulty. Either I am very lucky, either this puzzle is not what it seems. I solved it 3 times within 10 minutes, when I still hadn't found the trick, and this kind of puzzle is the first for me. Anyway, the sound it makes when twisting and manipulating it is great.